Soccer had traditionally not been as popular as baseball in Japan. That changed somewhat with the emergence of the J-League (Japan League) soccer league in the early 1990s and was dramatically altered when Japan became engulfed in soccer fever when it co-hosted the World Cup soccer tournament with South Korea in 2002. Soccer is particularly popular with young people. The flair and colorful hairstyles of the players is more appealing to their tastes than the disciplinarian coaches and dour team conformity that dominates baseball, dismissed by some young people as the sport of grandpas and grandmas. Many soccer fans are 20-something women. Soccer has been played in Japan since the 1870s. Interest in the sport spiked a little in the 1960s when Japan won an Olympic bronze medal in the sport. Internationally the players and fans were known more for their good manners than skill or enthusiasm. At the 1998 World Cup, the Japanese team lost all of its games but was praised for its sportsmanship. Japanese fans were spotted picking up confetti that had thrown by others in celebration. Japan has bid to host the 2022 World Cup. Qatar ended up being awarded the event. Japan hosted the World Club Championship in since 2004. It has been played in December in Yokohama and has been called the Toyota Cup since 2006. There is some debate as whether the competition will stay in Japan. Other countries are interested in hosting it. The World Club Championship features quarter finals between the champion clubs of Oceania, Africa, Asia and North America, with semifinals between the winners of these matches and the champion clubs of Europe and South America. The finals in mid December. The Japanese national soccer team is nicknamed The Blues, the Blue Samurai or Samurai Blue. Blue has also been embraced by other teams. France calls their team Les Bleus. Italy calls theirs The Azzuri (“Blue” in Italian). Serbia-Montenegro calls their Plavi (“The Blues” in Serbian). The national team has long been marked by an inability to finish and score. A lot of times it wins with a lucky goal or mistake by the other teams. Japan’s nemesis in World Cup soccer is Australia, which humiliated Japan at the World Cup in 2006 and always gives Japan a hard time. Japan’s rivals in Asia are South Korea, Saudi Arabia and Iran. Bahrain always gives Japan a tough time. Yata-garasu---a giant three-legged crow that led the descendants of the Sun Goddess to the homeland of the Japanese in Nara Prefecture---is the featured on the emblems worn by the Japanese national soccer team. Images of a three-legged crow inside a sun circle have been found on the banner of the Kumano-Hongu shrine, the center of the Kii Peninsula’s sacred lands and pilgrimage paths. The Yata-garasu on the national soccer team emblem is said to symbolize power and quickness. The symbol was adopted in 1931, in honor of Kakunosuke Nakamura (1878-1906), considered to be the founding father of soccer here in Japan. Japan won the Asian Cup in 1992, 2000 and 2004. Japan, Iran and Saudi Arabia have all won the Asian Cup three times. South Korea has won it twice (2004). In 2000, Japan won the Asian Cup by defeating Saudi Arabia 1-0 in final with a first half goal by midfielder Shigeyoshi Mochizuki in a game played before a crowd of 49,500 in Beirut. The game was almost a carbon copy of Japan's victory over the Saudis is the 1992 final of the Asian Cup played in Hiroshima. Japan was unable to make to final in Asian Cup in Vietnam in 2007. It lost 3-2 to Saudi Arabia in the semifinal. Iraq defeated Saudi Arabia in the final 1-0. In 1999, Japan’s under 20 team finished second in the FIFA World Youth Champion. The team had a good run before losing to Spain 4-0 in the championship game in Lagos, Nigeria. Japan beat China 3-1 in the finals of the Asian Cup soccer tournament in China in 2004. Television replays of Japan’s key second goal seemed to show that a Japanese player illegally touched the ball with his hand. In a first round game, between Japan and Thailand, in Chongqing---which had been subjected to fierce Japanese bombing in World War II---two Japanese players were left behind when an angry mob forced the Japanese bus to take off early after a game The angry mob surrounded the bus but didn’t throw anything. Throughout the game Chinese fans booed the Japanese team and threw garbage at Japanese fans. The Japanese government criticized the Chinese government for not doing more to protect Japanese players and fans and reign in the violence. In thrilling fashion Japan won the Asian Cup in January 2011 playing exciting, close, hard-fought games against nearly everybody they faced whether it was regional powers such as South Korea or upstarts like Syria---finally defeating Australia in the final 1-0. Japan beat Qatar 3-2 in the quarterfinal before hometown Qatari fans. After being reduced to ten men when Atsuto Uchida was red-carded. Japan went ahead for good with a goal in the 89th minute by Masahiko Inoha. 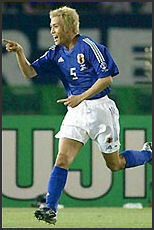 Shinji Katagawa scored the first two Japanese goals. Earlier in the tournament Japan beat Syria 2-1 after one of its players was red-carded. "It's been a tough tournament for us right from the beginning," Kawashima told Kyodo. "So to win it after the way they came back means a lot. The outfield players had worked so hard up to the shootout, but we unfortunately conceded in the very last minute. "I thought it was my time to step up. We've fought to come this far, but none of this will mean a thing if we lose the next one. We can win it, we just need to stay confident." The victory was only the 12th time Japan has beaten South Korea in 71 meetings. Japan’s coach Alberto Zaccheroni said, "The great thing about this team is that we leave everything we have out on the pitch, every time...When we concede, it's usually through set pieces," Zaccheroni said. "I was annoyed they scored that late in the game, but when I looked over at my players, I thought we could do it." “Lee spun in the box to connect with Yuto Nagatomo's leftwing cross and buried his left-foot shot in the top corner, leaving Australia keeper Mark Schwarzer motionless. The goal was reminiscent of Zinedine Zidane's legendary volley for Real Madrid in the 2002 European Champions League final against Bayer Leverkusen. "This is just the best," said Lee. "I have had to wait for playing time but my patience has paid off. I was confident I would be able to seize my chance if it came my way. I'm delighted." "It was a great win from a great team," said Zaccheroni. "It was a collective effort against a very strong Australia side. All of the players were tired but the team effort and team spirit pulled us through. I knew he (Lee) would do a job for us. We lost aerial power in taking off Maeda but I believed he would deliver. The whole of Japan can be proud of having a team like this." Japan appeared in the 2004 Olympics in Athens and the 2008 Olympics in Beijing and did poorly in both events. At Beijing in 2008 it lost to the United States and Nigeria and failed to advance to the second round. Japan’s appearance in Beijing was the forth consecutive time Japan made it to the Olympics. In November and December 2007 Japan held Saudi Arabia to a 0-0 draw to win a berth to Beijing. At the 2000 Olympics, Japan lost to the United States in penalty kick shootout in a quarterfinal match, preventing them from making the medal rounds. Japan was leading in the game 2-0 but got sloppy and allowed the U.S. to tie the game, forcing the game into overtime. Some of the fans that traveled to Australia to see the team play arrived on 3-day, no-night tours in which they flew from Japan on an overnight flight, did some sightseeing in the morning, watch the team play in the afternoon, had dinner and then flew home on another overnight flight back to Japan. One of the greatest moments in Japanese soccer occurred at the 1996 Olympics in Atlanta at when Japan beat a Brazil team with Ronaldo, Roberto Carlos, Rivaldo, Bebeto and Juninho Paulista 1-0 in Japan’s first games of the Olympics. The loan goal came when Ryuji Michiki launched a long kick and the Brazilian goalie collided withe the defender Aldair and the ball fell in front of Teruyoshi Ito who kicked it into the empty net, Japanese goalie Yoshikatsu had a super game, blocking 28 Brazilian shots. Japan then went on to lose to the eventual gold medal winner Nigeria and was unable to advance to the knockout phase. At the 1968 Olympics in Mexico City, Japan won a bronze medal. The match was dubbed by AFP-Jiji as "one of the greatest upsets in Olympic football history." “Japan produced a major shock... with pace and guile in a match that could have ended in a rout had the finishing been more accurate," the AP reported. Not surprisingly, the mood in Spain was one of lament. "Japan beats Spain clearly," declared the Spanish sports daily El Mundo Deportivo on its website. "Japan was expected to be technical and fast, but it also dominated a large part of the match with spectacular soccer." Brazil coach Mano Menezes paid Japan a compliment---but with respect to Iraq and China, who his team whipped 6-0 and 8-0, respectively, in recent friendlies. "I would say Japan are the strongest out of those teams. They saw a lot of time on the ball," Menezes said. "Things worked out for us tactically, and we were able to score a few goals."